Limited edition of 20 pieces in 18K white gold or red gold. 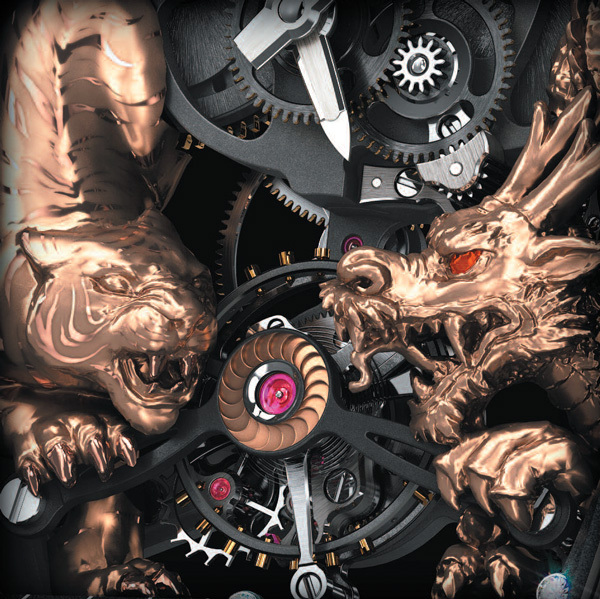 CALIBER RM51-01: manual winding tourbillon movement with hours, minutes and power reserve indicator. POWER RESERVE Circa 48 hours (±10%). This function is displayed using a differential power reserve system with a printed red line on a moving disc located between 10 and 11 o’clock. BASEPLATE AND BRIDGES ARE MADE OF GRADE 5 TITANIUM These components are in grade 5 titanium this provides the whole assembly great rigidity, as well as precise surface flatness which is essential for the perfect functioning of the gear train. 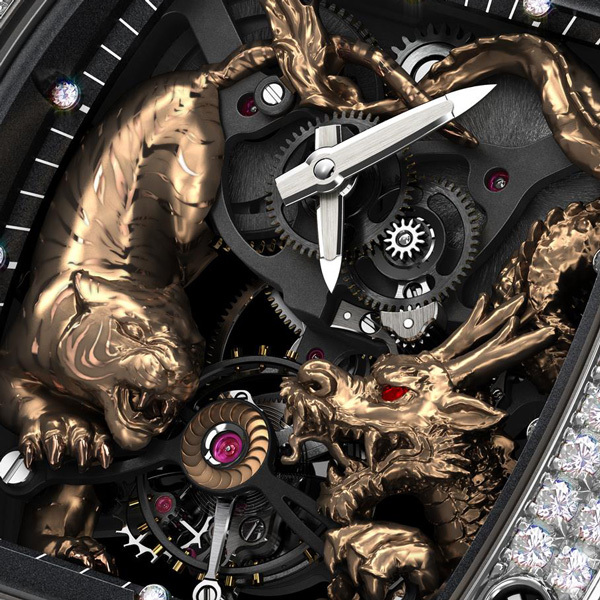 TIGER AND DRAGON ADORN THE MOVEMENT A tiger and dragon in red gold are integrated into the movement. Created from 3N rose gold, the figures are carved and incised entirely by hand. Special miniature tools needed to be made for the specific artistry required in the physical realization of these two creatures. To increase the realism of these special animals, a long and painstaking process of hand finished micro painting was executed, also including the unseen parts of these two marvelous entities. 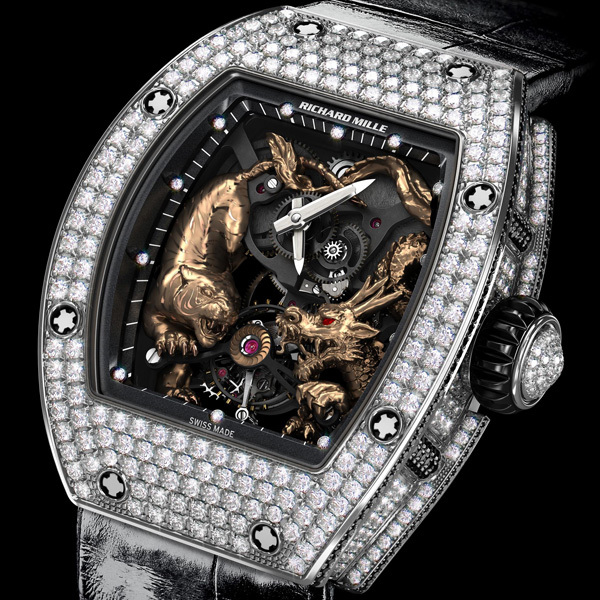 The tiger and the dragon have deeply influenced Asian culture. The Tiger, considered as ‘Yang’ supremacy, therefore male, was viewed as a demon hunter. For the military, the tiger, symbol of courage, was represented on shields and weapons. The dragon, meanwhile, is a very common symbol in China, taking on many complex traits, as an emblem that can unify a group, or a larger nation. Today we closely associate it with prosperity and happiness. FREE SPRUNG BALANCE WITH VARIABLE INERTIA The free-sprung balance provides better reliability in the event of shocks, movement assembly and disassembly. It also guarantees better chronometric results over an extended period of time. The regulator index is eliminated and a more accurate and repeatable adjustment is possible thanks to 4 small adjustable weights located directly on the balance. BARREL PAWL WITH PROGRESSIVE RECOIL This device permits a profitable winding gain (circa 20 %), especially during the winding start. It is also helpful in the distribution of the mainspring’s internal tension. Barrel shaft: in nickel-free chronifer (DIN x 46 Cr 13 + S) with the following characteristics: stainless- antimagnetic - suitable for tempering. CASE The three-part barrel-shaped case is highly curved which means the watch is comfortable to wear but considerable time is required for its production and quality control. 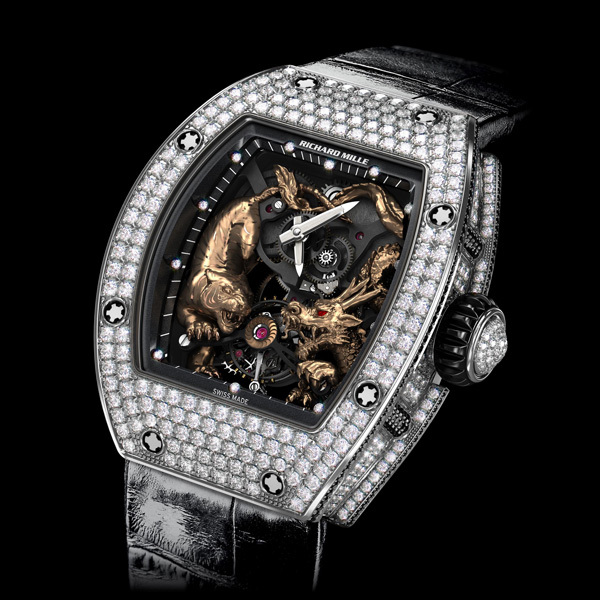 The ergonomic and visually distinctive curvature of the case is typical of all Richard Mille timepieces, requiring absolute precision and a total lack of tension in the metal. These requirements for the case design are based on a year’s research and development. 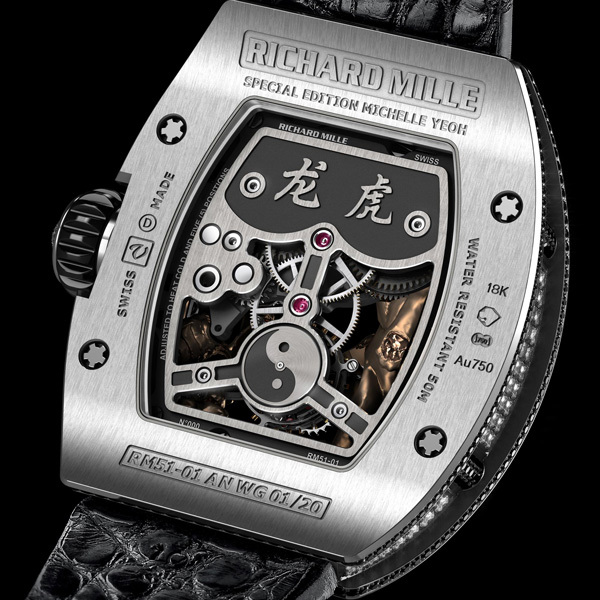 The characteristic tonneau shape of the RM 51-01 requires no fewer than 47 preliminary stamping operations including 21 for the tamping before production actually can begin. TORQUE LIMITING CROWN This additional security system prevents from accidental overwinding, which could cause damage to the winding stem or putting extreme pressure on the mainspring barrel. FLANGES Upper and lower flange in black metal. Thickness: at the center 1.00 mm and outer edges 1.73 mm.